Have 3TB Seagate drive that appears to have lost it's partition table(s). Have tried several utilities to recover the tables. One of the utilities scanned the entire physical drive and found dozens of small partitions (largest 2 GB). WTF??? I thought any HD only a single partition table. I think the drive had maybe two or three partitions on it originally and they should have been maybe a terabyte each. Or they maybe only a single 3 TB partition. My problem began when I move the drive (USB enclosure) from a Windows 10 machine to a Windows 7 computer. The conversion was done AFTER I first found the drive had problems. Basically, the MBR to GPT conversion made no difference at all. MS$ disk manager shows that the drive has one 349 GB partition and 2445 GB unallocated. Also the 349 GB partition shows as unformatted. I figure I will eventually do manual editing on the PT, which I'm qualified to do. I just need to get the very best write up on doing these edits on either MBR or GPT PT's. All help advice would be greatly appreciated. Seagate's enclosures are configured with a 4KB sector size. This enables large drives (> 2TB) to be partitioned with a single MBR partition up to 16TiB in size (for reasons of compatibility with Windows XP). When you remove the drive from such an enclosure and connect it to a SATA port on your motherboard, you expose the drive's native 512-byte logical sector size. This means that you now have a 4KB file system on a 512e drive, thereby rendering your data inaccessible. Assuming the problem is the sector size change, I think you should be able to recreate the partition table with fdisk and multiply the start and end sectors by 8. Before doing this I would make a backup of the first and last 35 blocks (512 bytes ea), this might be excessive but it won't take much longer and covers the maximum size of a GPT partition table and the backup table. After doing this I would only mount read only until you are sure it's correct, and if the data is important, I would not write to the drive at all, just make a copy and work with that. Thank you for your response. I'd hoped to get the attention of some REAL experts, and you seem to have good info. The Seagate drive was taken from a Seagate enclosure and placed in MediaSonic 4 bay Probox. I will study what you said more in depth and hopefully get a solution. And thank you for your info as well. So many of these forums have many people asking for support and few responding. I am very grateful for both you guy's responses. I may post more after I tried your suggestions. Progress??? I dunno. At lease a clue?? But I put the drive back into the original enclosure. Now it shows the ENTIRE drive as UNALLOCATED. The 349 GB unformatted does no show in the original enclosure. P.S. I posted another message an hour or so ago. It's supposedly waiting for moderator approval. @boowho, you need to restore the original partition table. To this end you could use DMDE (disc editor). There should be a 3TB partition in DMDE's Partitions window. R-click it and select Insert Partition (Undelete). Then Apply the changes and remove and reinsert the USB drive to enable Windows to mount the file system. You may need to remove the GPT stuff beforehand. That said, you should backup your data or clone the drive before making any changes. But that's your call. Well, I'm treading carefully. Using DMDE I can see all the data and directory structures. everyone provided. Hope fully this will post; a couple of my responses said waiting for admin approval. Actually the true source of the original problem is that the drive in question is a 4KN (Seagate ST3000DM001) although Seagate specs say it's 512e capable. The Mediasonic 4 bay enclosure specifically states (in the fine print) that the enclosure will NOT handle 4KN drives. The ST3000DM001 has a white sticker with only the letters "AF" in black; not what I've read about labeling "standards". I've tried to maybe find a jumper on the drive or set the mode with a Seagate supplied utility, but neither is apparently possible. I did manager to rebuild the partition table so I got my data back, but going forward I think the MediaSonic ProBox will need to be returned. Most interesting I find that the Seagate 3TB drives are several years old and have AF, but an almost new WD 6TB drive apparently does not use AF. P.S. DMDE is a fantastic tool, BTW. AF is not the same thing as 4Kn, if that's what you are saying. An AF drive is low level formatted with 4KB physical sectors -- it can be either a 512e or a 4Kn drive. That is, even though the drive's internal physical sector size is 4KB, its logical sector size could be either 512 bytes (512e emulation) or 4096 bytes (4Kn). The USB-SATA bridge firmware in Seagate's enclosures presents a 4Kn logical sector size to the USB host, while the internal sector size remains at 512e. That is, the bridge grabs 8 x 512e sectors (LBAs) from the HDD and packetises them into a single 4Kn sector for transmission to the host. OK, got all data to show again by rebuilding the partition table(s) using the original Seagate enclosure. Then had to completely dump the data from the (2) 3TB Seagate drives (in the original Seagate enclosure). Then completely re-partition and re-format them (in the Mediasonic enclosure) and then reload the data. All successfully working now, but what a PITA. Better take care with those 3TB Seagate drives as they will die shortly. Make sure to backup all the data on them ! Any particular reason why you say that??? 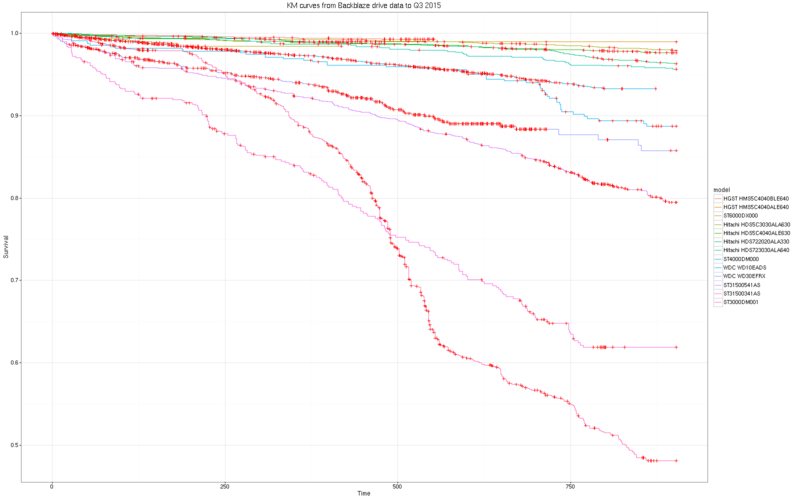 +1 "worst crap drives ever"
Have a look at the survival rates graph from this analysis of BackBlaze's failure rate data. The bottom curve is the ST3000DM001.